For the second time in a couple weeks, I got a chance to watch a Bela Lugosi movie I’ve never seen before. 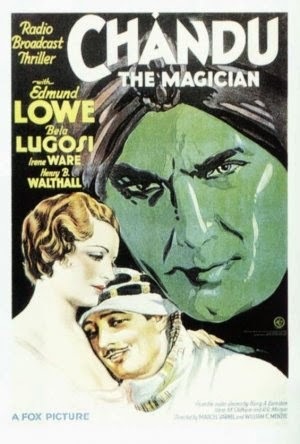 But unlike You’ll Find Out, 1932’s Chandu the Magician, a film based on a popular radio serial, was produced when Lugosi’s popularity was at its zenith (aside from his iconic performance in Dracula a year earlier, Chandu the Magician was released within months of Island of Lost Souls and Murders in the Rue Morgue). This time out, the actor portrays Roxor, an arch villain determined to conquer the world. Having completed his mystical training, Frank Chandler (Edmund Lowe) is made a Yogi by his Hindu masters and given the honorary name “Chandu”. His first assignment as a Yogi takes him to Egypt, where he must help his brother-in-law, Professor Robert Regent (Henry B Walthall), who, shortly after completing work on his powerful death ray, was kidnapped by the sinister Roxor (Lugosi), a madman intent on using the ray to destroy some of the world’s biggest cities (including London and New York). Along with trying to save mankind, Chandu attempts to rekindle his romance with Nadji (Irene Ware), a beautiful Egyptian Princess with whom he’s madly in love. Despite a valiant effort by Lowe, not to mention a very cool opening scene (in which he puts his powers to the test), Chandu is, regrettably, the least interesting character in his own movie, spending half his time staring at his enemies (his power is in his eyes) and the other wooing Princess Nadji. Faring much better is the work of co-director William Cameron Menzies, whose excellent sets (most looking like they were lifted straight out of ancient Egypt) are matched only by the movie’s special effects, which Menzies undoubtedly helped design (one of the films best scenes has Chandu turning the tables on three of Roxor’s cronies by transforming their rifles into poisonous snakes). What’s more, the cinematographer on the film was none other than James Wong Howe, who was nominated for 9 Oscars over the course of his career, winning twice (for The Rose Tattoo in 1955 and 1964’s Hud). Then, of course, there’s Bela, so deliciously menacing as Roxor. Decked out in black, his Roxor is evil personified, a man whose sole ambition is to reduce the civilized world to rubble, then set himself up as a God to rule over what remains. From start to finish, Lugosi does a masterful job, giving the film a villain that, despite being three times more interesting than its hero, is a man we want to see destroyed. Lugosi’s flamboyant portrayal, coupled with Menzies’ eye for detail and Howe’s fluid camera movements, make Chandu the Magician a very entertaining watch.